We also covered the gestation of Di and Susan’s maths ‘baby’, a series of educational maths-based superhero adventures in need of a name. Suggestions on a postcard please. Anyway, on to the film. After 2.5 metres of pizza between us, we had a technological first courtesy of Comrade Smith, Lucy: the first film screened through Netflix. This was an exciting development, even if Netflix’s bizarre genre classification threatened to derail the evening’s entertainment at one point. 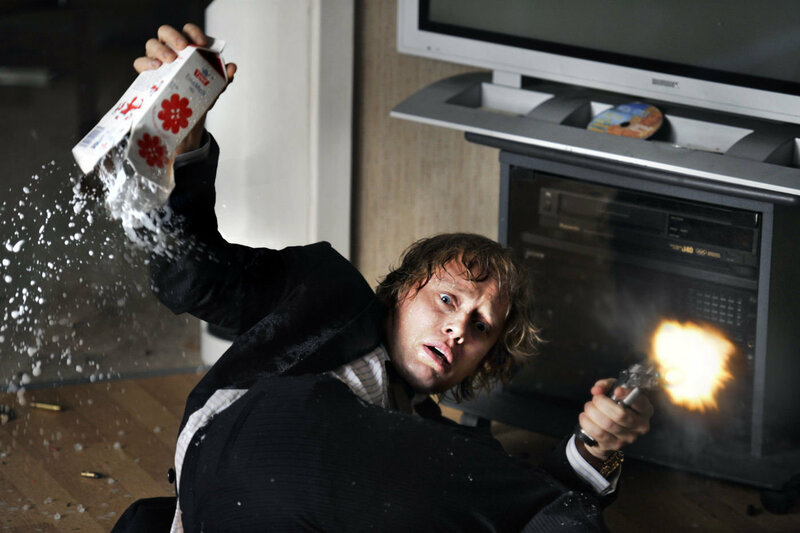 The film was Headhunters, a Norwegian crime thriller with flashes of black comedy ( or ‘superior nordic noir heist caper’) based on a book of the same name by Jo Nesbo, also Norwegian. The film was massively violent, presumably based on similar levels of violence in the book, which is worrying when you think that Nesbo is also recognised as a writer of children’s books. The film tells the story of Roger ‘Rogg-err’ Brown, a successful headhunter with a beautiful wife and super stylish house who feels insecure about his average height and tries to compensate for it by moonlighting as an art thief. Everything starts to go wrong for Roger when he steals a painting from Clas Greve, a new client looking for an executive position. The plot takes some unexpected twists and turns involving a big dog, obese twin policemen, a Russian prostitute and a lot of poo. So much poo, in fact, that during post-film chin-stroking we coined two new phrases: ‘full body poo’ and ‘poo hobbit’ (Adam, I’m still chuckling at that one!). We also tried to decide whether there could be a whole new genre of films involving full body poo. We got as far as The Shawshank Redemption and Slumdog Millionaire; again, additional suggestions on a postcard please! Roger was played by Aksel Hennie, the albino love-child of Christopher Walken and Steve Buscemi. Hennie is in fact 5 cm taller than Roger Brown and so, one hopes, has not felt the need to lead a double life as a criminal mastermind (in spite of being the first person in Norway to be convicted of doing illegal graffiti). Danish actor Nikolaj Coster-Waldau who played Clas Greve may be more familiar to some as Jaime Lannister in Game of Thrones. As Jess correctly informed us, Roger’s wife Diana was played by film critic Synnøve Macody Lund in her first film role. This was confirmed by an interview with Aksel Hennie by Idol Magazine. Jess’s knowledge of Headhunters trivia also meant that we discovered that ‘Marky’ Mark Wahlberg is keen to feature in a US remake of the film. For your benefit, when researching for this Tuesday Review, I bravely Googled poo hobbit. It only returned one loosely relevant result which you can find here. Some people just have too much time on their hands. Other dedicated Googling threw up the gem that is The Internet Movie Firearms Database. Yes, gun enthusiasts can find out more about the guns used in the film and what modifications have been made to them, and reassure themselves that the game Ove indulged in with Natasha was ‘very unsafe’.